If you're new to sewing with felt and especially with making plushies, you may be wondering how on earth you can transfer a pattern onto felt so you can then cut it out. Don't worry, you're not alone. Many crafters wonder the same thing. How do you get from a printed pattern page to those cut felt pieces ready to stitch together? I'll outline some easy methods that I use to transfer patterns to felt for cutting. And you'll learn about some other popular techniques that make this process simple too. There are lots of felt pattern templates online whether you get them for free or buy them from individual craft websites or an ecommerce platform like Etsy. I'll show you how to take your printed patterns and then transfer them onto your felt so you can cut out the pieces ready for assembly. Most often this is to make plush designs but you also get felt patterns to make flat felt sewing projects as well. These techniques need you to print off the patterns (or have printed copies) first although some may require that you print onto either paper or card. Read through each of the methods first before deciding which to try out. The trace on felt technique requires that you draw around your pattern straight onto the felt. You can do this with paper pattern pieces although it is far easier to use card templates. Pattern pieces made from card are easier to draw and trace around because they are sturdy and they can also be kept and reused over and over again. I have some cardboard templates that are around 20 years old and still in great condition. You can print your pattern straight onto card or, alternatively, print your pattern onto paper and then glue it onto card and cut out the individual pattern pieces. A glue stick normally works well for this purpose. Once you have your individual card pattern pieces, you can trace around them straight onto the felt fabric. For this purpose, I prefer to use a water soluble / erasable fabric marking pen which are normally a blue ink. There are a number of temporary fabric marking pens that work in much the same fashion. The water soluble ones require that you dab the ink off, when you no longer need it, with a little water. I like them because the marks stay put until I want to remove them. There are other choices of temporary fabric markers including ones with disappearing ink which are both air and water soluble. There is a purple one by Dritz. And there are also some heat erasable fabric marking pens where the marks disappear after applying heat. As well as the official temporary fabric markers designed for that job, there are other options of pens that will mark felt fabric - albeit permanently. I don't recommend standard marker pens, felt tips or Sharpies in order to mark felt for cutting, although you could certainly use these for permanent methods of drawing or coloring instead. Standard marker pens can either bleed unattractively into the felt or make horrid thick lines which are totally unsuitable for pattern marking. You can always test them on a spare patch of felt if you want to be sure of results yourself. The idea is not to be left with any lines on show at all. If you are marking the reverse side of the felt which will be hidden after sewing, you could use a ballpoint pen. Ballpoint pens mark felt quite well and leave a fine, precise line. The issue with most pens is that they don't work well on darker colored felt like navy blue and black because you can’t see the pen mark very well if at all. When you are using dark felt colors, I recommend tracing with chalk. 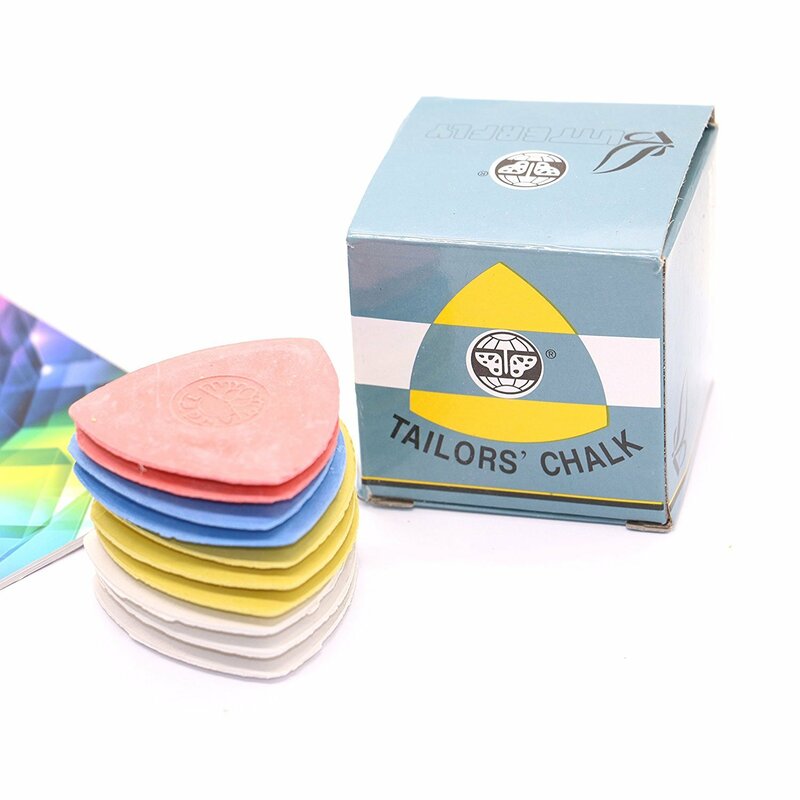 You can use Tailor's chalk which is traditionally used by dressmakers and sewers. 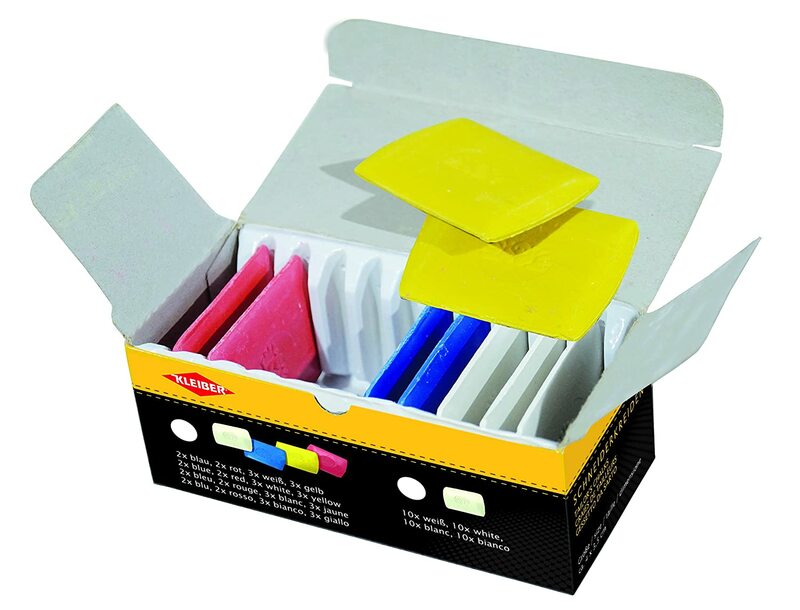 These chalks normally come shaped as triangles of chalk in light colors such as white, yellow and pink. For marking finer lines, there are chalk pencils for fabric and chalk liners such as Clover Chaco pens which have powdered chalk dispensed from an easy to hold pen style holder. Using your choice of marker, hold your pattern piece firmly on the felt and trace around it. I prefer to mark on the reverse of the felt if I can. Felt is normally the same both sides (unless it has a printed pattern) but what I mean by reverse is turning the pattern piece upside down and tracing around it. Turning the pattern upside down means that the mark will be on the back of the pattern piece and the front will have no visible mark. You can either cut just outside of the line, on the line or just inside the line. I tend to cut just outside the line because this is easy for me to cut and I know that the marks will be on the reverse or come off later. If you cut just inside the pattern line, you can actually cut away the mark although I find this method much harder to cut neatly and accurately. If you prefer not to have any marks or lines on your felt, try the other techniques for transferring patterns to felt instead. You might find it a bit long-winded to have to trace around the pattern pieces before you can cut them out and then have the additional work of hiding or removing the traced lines afterwards. I find it easy but here is my second favorite method. Many sewers, especially those who make their own garments, are used to the pinning and cutting method of working with pattern pieces. You need your pattern printed onto paper and the thinner the paper, the better. Cut out the pattern pieces and pin them onto the felt. ⭐ Use fine and long pins such as dressmakers pins to hold the pattern pieces in place. The sharp points of each pin should face the outside edge of a pattern if possible as this helps to avoid bumps forming in the felt. Remember too to keep the pins inside the pattern lines because you cannot cut over them with scissors. You could now draw around the pattern pieces if you want. However, that would defeat the purpose of pinning which allows you to simply cut carefully around the pattern pieces directly through the felt. You cut just on the outside of the paper pattern, not on the top of the paper, otherwise your fabric scissors can quickly get dull blades. This is probably the very simplest method of all. Just hold your pattern piece in place over the felt and cut the shape out. For very basic and simple shapes to cut, this method can work just fine. It isn't a great idea to use this technique with very small and intricate pattern pieces or designs that are fiddly to cut. Hold the pattern piece firmly on top of the felt, you need to ensure that the pattern does not slip. It helps if your pattern is on top of some felt that is easy to turn in your hand as you cut around it. If you are confident at cutting felt fabric, you may want to give this technique a go. It is worth practicing on some old pieces of felt first to get used to holding and turning the pattern and felt together as you cut around. This is a bit of a cheat method because it involves no cutting by you whatsoever. It may not work well for everything and will likely have a limited use. 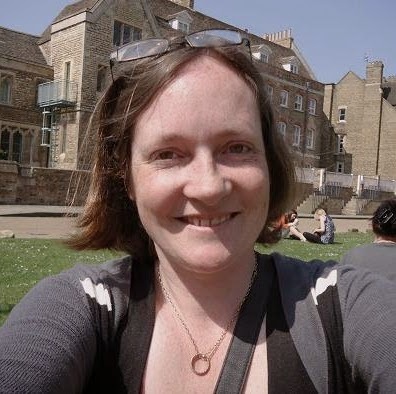 However, it is worth a mention. You can buy pre-cut felt shapes. There are many simple felt shapes for sale including circles, hearts, squares, triangles, flowers and more. Of course, this may not fit with the pattern you have in mind but there are certain shapes that you find you will use over and over in your hand sewing crafts. ⭐ Circles are a shape that so many people find difficult to cut by hand accurately and they are used pretty often for making felt plushies and designs. Circles are often used for eyes, making felt flowers and as decorative motifs. It's not a bad idea at all to buy assorted sizes and colors of felt circles so you don't have to worry about cutting them yourself. Some of the craft cutting machines like Cricut and the Bigz dies in a Sizzix are also able to cut felt for you. It is possible that you can use a machine to cut simple shapes and even patterns out. My Sizzix Big Shot is able to cut simple felt shapes out. Some crafters recommend ironing freezer paper (with the pattern traced on) to the felt. This sticks the paper temporarily onto the felt so you can then cut around it. I don't use the freezer paper method. It takes more preparation than I'm willing to do both in re-tracing the pattern and then ironing it on to the felt. If you do use this technique, I would recommend buying a new pair of scissors and keeping them just for this specific purpose because cutting through the freezer paper and felt can dull your fabric scissors. Cutting right through the paper pattern is an easy technique if you struggle with cutting felt patterns out and very accurate. It is ideal for those small and intricate pieces which are fiddly to cut around. I'm not convinced it saves any time over other methods as you still need to get the iron out and iron all your pieces before cutting. Place the shiny side of the freezer paper down over your printed pattern. Trace the pattern using a pencil. Cut roughly around each pattern piece so there is a wide margin around each one. Turn the iron onto a low heat setting and turn off the steam. Place some plain cotton over the felt so that the iron cannot damage the felt when ironing and iron over the top. The warmth of the iron should temporarily stick the freezer paper to the felt. Once all your individual pattern pieces are ironed, turn the iron off and cut each pattern piece out on top of the traced line. Then peel off the freezer paper. These are all the main techniques that you can use to transfer a pattern onto felt for the purpose of cutting it out. You just need to find one of these methods that works well for you and use it. just the information I was looking for. need to put patterns on felt and never used felt before. thank you for the choices for a beginner like me.